This recipe will install Trac: an integrated SCM and Project Management solution that gets along very well with Cherokee. It is written in Python and can work with Cherokee either using HTTP or SCGI protocols. The recipe will address the second scenario because it is slightly more complex. Should you wish to run it via HTTP, Cherokee would only have to relay the requests to Trac acting as an HTTP reverse proxy and no other configuration would be needed on that end. The software requirements are Python-2.5, easy_install and SQLite-3.3.4 or above. Flup is also required unless you want to use the HTTP-proxy method, and SQLite can be replaced by PostreSQL or MySQL if you wish to do so. On Debian based Linux distributions, just a couple of commands issued as root would suffice to provide the requirements and install Trac. The package names could slightly vary on different distributions. Of course, the path should be changed to whatever suits your needs. You will be prompted for more details. If you want to configure authentication or simply need more details, refer to the Trac installation instructions on the official site. The configuration on Cherokee’s side is quite simple. In fact, the configuration of Cherokee is so simple that you can find the application in the Market and have it deployed within seconds. You will be asked for the minimal information required, and everything else will be handled for you. By now, your Trac installation should be up and running. Try it out! If you used the Market, you can skip the rest of the document. It only details what manual steps must be taken. 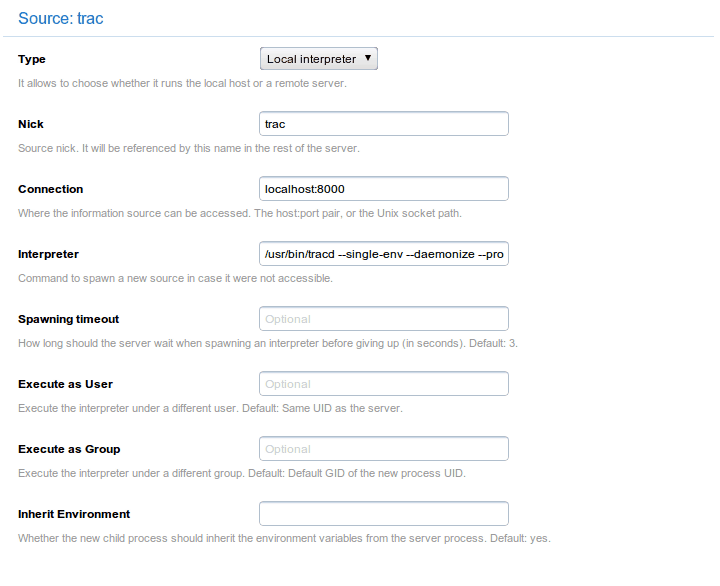 You will only need to know that you can spawn Trac as an SCGI process. You can either start it manually, or better yet, automatically by letting Cherokee spawn the server whenever it is down. The process is fairly simple. First we will set up an information source with a local interpreter. If the port was not reachable, the interpreter command would be launched and the process would be reinstantiated. Note that, in the definition of the information source, you will have to manually launch the spawner if you use a Remote host as Information source instead of a Local interpreter. 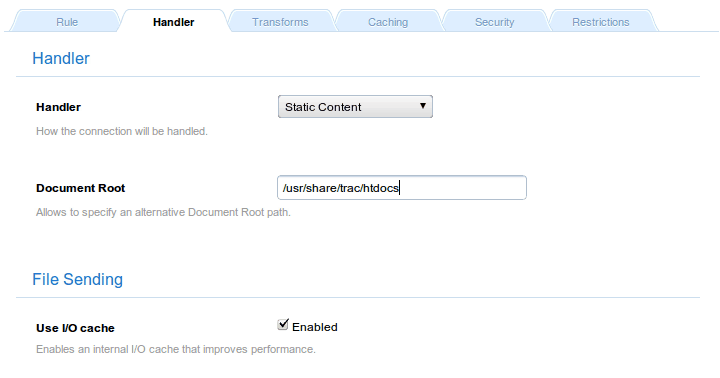 After doing this, we will just have to create a new rule managed by the SCGI handler to access Trac. 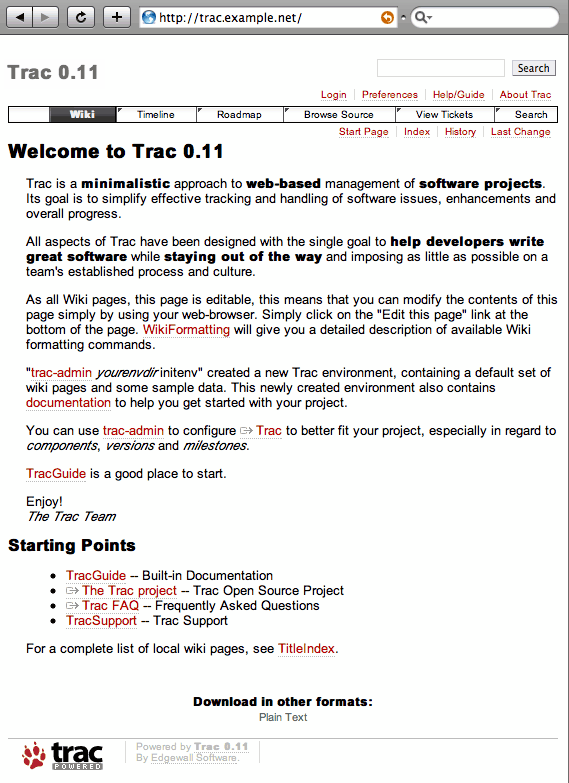 It can be created in a new virtual server, trac.example.net for instance, or as a Directory rule for a specific path such as /trac. As you can see, we are opting for the first approach and will only need two rules. 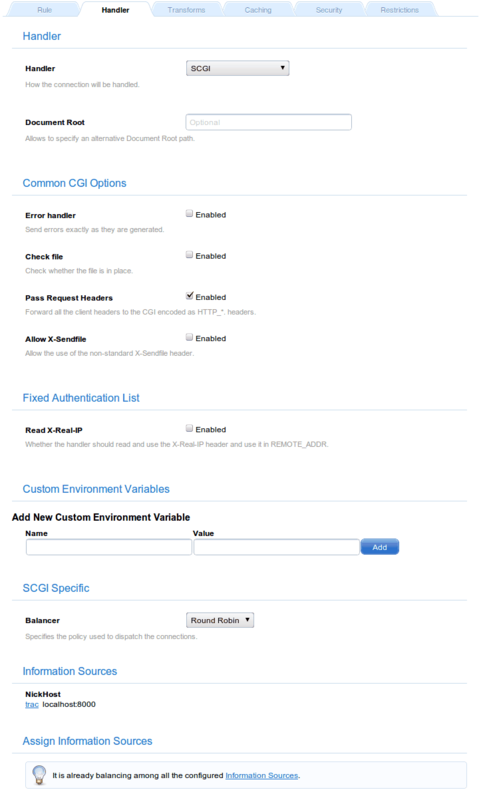 The default will use the SCGI handler as detailed above, associated to the previously created information source.